I have to say that I had a great time putting this one together. 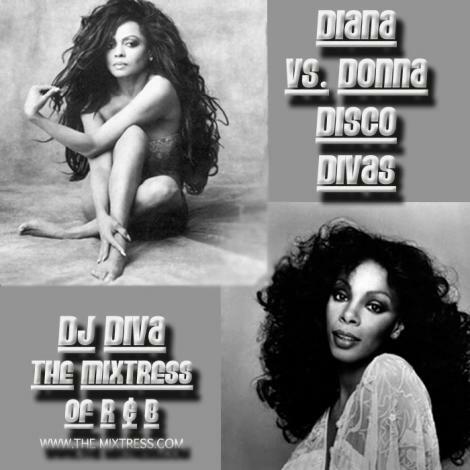 I was going to do Disco but somehow it shaped up into a battle between Diana Ross and Donna Summer. Long before there was a Bey Bey and Rhi Rhi battle…there was the grown Diva battle between Diana and Donna. Disco was good for Diana’s emerging solo career and for the newcomer Donna’s breakout hits. The 70’s were good to these ladies so I included most of their fast hits. I will be honest…the last part of the mixtape was a birthday request for myself. I loved Diana’s ballads in the 70’s so I tacked on my favorites. I think my absolute favs are “Remember Me” and “Good Morning Heartache”. She killed it in Lady Sings The Blues and Mahogany. Special Thanks to EJ and Fave for helping me with my technical difficulties and to all my podcasting friends who gave me drops! For me the win goes to Diana aka Ms. Ross (and it helps that she’s an Aries like me). Who would you choose? I’m a Donna Summer fan. Gotta give it to her ’cause she’s the Queen of Disco. Hard to make a choice. For ballads it has to be Miss Ross (funny you mentioning Mahogany, soundtrack of a first unrequited love affair(I was young, irish & catholic!!!) it was a present from my first love…and how she broke my heart…but that’s another story. Thanks for this collection…taking me down memory lane. OMG. This just made my dull Monday afternoon perk up! Glad I stumbled on this. I love Ms. Ross, but La Summer has been as necessary as air in my life. I hate to pick favorites between these two because they are both legendary, beautiful, influential divas of not only disco, but R&B, and pop. The really laid the foundation for today’s Whitney’s, Janet’s, and Beyonce’s. So I’m not going to pick (Donna, Donna, Donna – LOL), I’m just going to enjoy the music. I look forward to popping back on this site too! @Eugene mmmm u soo right on the ballads..I had to include them..and Donna may just be the queen of the uptempo..I tried to start a beef LOL I’m glad you were pleased..Peace my Irish Catholic brother from across the pond! @Keith I hope you keep coming back and that I keep perking up your day! I have about 100 mixes so check out the search box and find you some more mixes! Diana Ross.. Oh damn maybe Donna.. I don’t know.. Ok on the strength of my mother & twin memory and house parties rocking out to Love Hang Over and the Boss Diana Ross has to come out slightly ahead.. Okay It’s My House did it for me.. awwww..this is so Cypress Ave and the twins (my moms and her sister partying) wow!! they wore out Diana Ross..